Olive Tree Villa is a peaceful holiday retreat set in an ancient Tuscan country villa which has been completely renovated in an entirely biological way. Owned and managed by Alberto and Natalia who have both dedicated their lives to the tourist profession, it has grounds of just over 3 hectares mainly cultivated with olive trees. The property is completely secluded and is located on the historic Montalbano hills, where Leonardo da Vinci was born and grew up. In the nicely landscaped gardens around the property is set the swimming pool with a nice recreational area and lawns for sunbathing and barbecuing. The swimming pool has a generous size of 6x13 mt, with a smaller pool for young children, and there is also a nice Jacuzzi. Benches, deck chairs and shower are available by the pool. Sauna and Turkish bath. The villa is furnished and decorated to a very high standard, with satellite LCD videos. Vegetable garden: In season, guests are welcome to pick for their personal use, fresh fruits, vegetables and herbs. Olive oil: During the olive picking season, end October/November, guests are welcome to participate in the picking and the oil making process, and to take home their own oil! Barbecue area near the pool has full cooking facilities and dining for up to 12 people. Swimming pool available from Easter till October. Hot water jacuzzi always available. Sauna and Turkish bath available with extra charge. MTBs available free of charge. Pool barbecue area available. Guests are kindly requested to refrain from smoking inside the accommodation. Children must be supervised at all times. Some rooms with air-conditioning. Great address to go on holiday with a large group (10). Good contacts with the owner who regularly gives tips on the environment and what is interesting. Cleaning was fine and you are very free to determine how to use the rooms and terraces. Great view from the mountain. The road to the house is a challenge because it is quite narrow. Our family of 11 enjoyed our stay. Natalia was a gracious host. There was wine and fruit for us when we arrived. She also gave us some of her oil to taste. The view was amazing and the pool wonderful. We enjoyed several meals by the pool. The kitchen is small but it was good enough. The house is at the top of a hill so the drive way is a bit steep but it is worth the view!! We just back from our Italian holiday. We flew to Venice and stayed there for a few days, then hired a car and drove (approx. 3 hours) to Olive Tree Suites in Tuscany where we stayed for a further 7 days in the Honey Suite. It was perfect for 2 with breathtaking views of the valley from our bedroom, the lounge and the terrace. We were the only ones staying due to it being low season so we had the pool and hot tub to ourselves. Again, the views from the hot tub which was surrounded by olive trees were out of this world! Our hosts, Alberto and Natalia were great, their English was incredibly good, far better than our Italian (not difficult) and they were very much on hand in case we needed absolutely anything but at the same time left us to enjoy our holiday. Even when we locked ourselves out at midnight Natalia was incredibly understanding. They left us 2 bottles of their own wine when we arrived which was excellent as well as their own organic olive oil and a huge bowl of fruit. They recommended a great local restaurant which we walked to and my husband is still raving that it was the best T-bone steak he's ever had! They also suggested some fab places for us to visit like Vinci where Leonardo da Vinci was born and grew up and Lucca which had a wonderful botanical garden with terrapins and huge Carp in the pond. Florence was only an hour away but we decided to visit more local towns and villages as we had visited Florence in 2013. A hire car with a bit a umpf is a must for Olive Tree Suites with it being up on the mountain but without the mountain you wouldn't get the incredible views! We'll definitely be recommending our friends and family to stay with Alberto and Natalia again! We stayed in the Honey Suite, with our 12 year old daughter, for 2 weeks in August. As there was no one staying in the larger apartment, we had the whole place to ourselves. Natalie met us in Lampoggio so that we could follow her as our sat nav had stopped working!! There was a huge bowl of fresh fruit, olive oil and wine in the apartment when we arrived - thank you! Natalie was lovely and nothing was too much trouble - from printing out train timetables to letting us borrow her iron! The information folder was really useful, We ate at both the golf club and the restaurant walking distance from the apartment. both where excellent. The villa was beautifully restored with beamed/brick tiled ceilings, lovely flooring and plenty of space. The facilities in the kitchen area where good, but did need a little updating. Everything in the apartment was clean. The outside terrace from our apartment was large with a beautiful view. The communal eating area and pool where well set out and we spent some time cooking on the BBQ. There was everything you needed - gas rings, sinks, built in BBQ and even a fridge to keep your wine cool! The villa and surroundings were beautiful but needed some time/maintenance to return them to their former glory - the water in the pool was clean as was most of the bottom area but we were disappointed to see that all the edges at the bottom were very green as was the areas around the outside, under the grilling. Some grills were missing or loose which was a hazard. Parts of the gardens needed weeding and shrubs cutting as they partly blocked paths and made areas look unkept. Overall this was a beautiful place but we felt it needed some Tlc (tender loving care) to return it to its former glory. Our family visit to Olive Tree Suites was wonderful. The Villa, bedrooms, kitchen facilities, pool suite, pool area, wine, walking paths, & the views were everything we had hoped for. Alberto & Natalie were the perfect hosts. They went beyond our expectations to make our stay as comfortable and relaxing as possible. The pool area was so enjoyed by all including our 3 young grandchildren. Spent much time at the pool outdoor kitchen area for grilling, pizza making & lounging. We hope to visit Olive Tree Suites and our hosts again some day. We had so nice holiday with my family and my sister´s family in this nice, peaceful villa. It`s has so magnificant views down to the valley, especially at susrise and sunset time. The whole of villa has been renovated with very nice style and the pool area is excellent ! With barbecue grill and nice pergola-area also in outside. 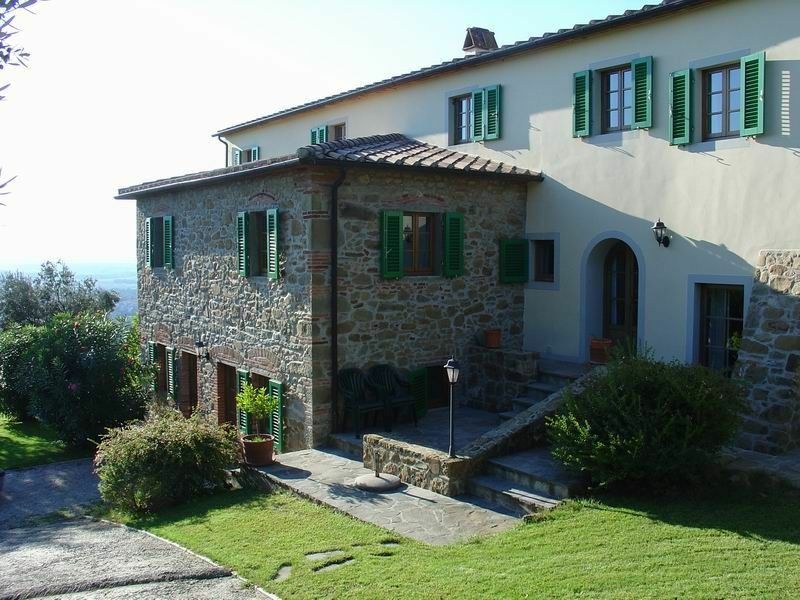 This villa is located so excellent location, little villages nearby with bikecycles ( also included) or walking distances, Lucca, Pisa and Firenze close to villa also.The owner family provided good customer service and willing to answer all our questions. Olive Tree Villa is located on the Montalbano hills surrounded by 800 mature olive trees. The nearest village is Porciano and can be reached with a short walk or by mountain bike. It has a grocery shop and a bar, a pizzeria and a good country restaurant, and several ancient buildings, towers and churches. Always walking or by mountain bike you can reach Anchiano, where you can visit Leonardo da Vinci's home, the old town of Vinci, the hamlet of San Baronto, the town of Lamporecchio and the beautiful Villa Rospigliosi, built in 1667 by pope Clement IX. A short drive away, less than 12 miles, you can reach the spa town of Montecatini Terme, the historic town of Pistoia, and the market town of Empoli, the main Italian place for clothing. Less than 30 miles away you can reach most of Tuscany, including Florence, and the historic towns of Pisa and Lucca, and even Collodi, the home town of Pinocchio! Popular seaside resorts, such as Tirrenia and Viareggio, are less than one hour away. Other Activities: wine tasting, climbing. Golf: The Montecatini Golf Course, located in Monsummano, 6 km from Olive Tree Suites, is on beutifully landscaped hilly grounds with wonderful views all way round. 18 holes, and there is a spa, swimming pool, club hotel and restaurant. The restaurant uses mainly local fresh produce and has a new menu everyday. Everything is so tasty and delicious, and you will not believe how reasonable it is to have a meal in this wonderful relaxing place! REDUCED RATES AVAILABLE WHEN BOOKING BOTH SUITES !!! Both suites are ideal for parties of up to 12 people and entail exclusive use of swimming pool! Rates include bed linen and bath towels, pool towels, final cleaning, central heating when needed, gas and electricity, use of washing machine, use of mountain bikes, wi-fi connection.